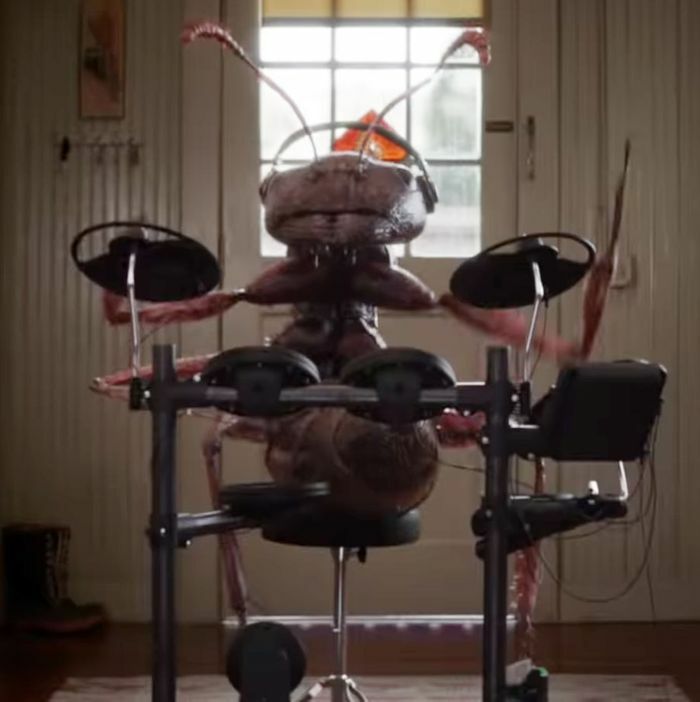 A human-sized ant in Ant-Man and the Wasp. The Marvel superhero Ant-Man isn’t just called that because he can shrink down to the size of a breadcrumb and become impossibly strong for his size, as ants are. He’s also called Ant-Man because, well, he gets along with them. He might be the greatest friend to ants since the guy who invented the picnic. Just as they were in the first Ant-Man movie, ants are everywhere in the new Ant-Man and the Wasp. As in the original, they carry our hero on their backs when he’s in thimble-sized mode, but now, thanks to the magic of Pym particles, the movie also features dozens of ants who’ve been blown up to human scale. They do menial tasks as entry-level workers at Pym Technologies, fill in as guard dogs in a pinch, and, memorably, act as a stand-in for Scott Lang (Paul Rudd) whenever he breaks house arrest, which means re-creating his daily routine of taking long baths and generally dicking around. Z-4195 could never. The first time we see the ants, they’re performing what look like complicated engineering tasks around Pym Technologies. This seems way above the job description for ants, even for drones. Are these insects on the payroll? Or are they unpaid ant-erns? What even would an ant be paid in? Much as human employees can sometimes receive benefits in the form of juice-cleanse discounts rather than 401(k) matching, could these ants’ compensation be primarily nonmonetary? Cursory Googling suggests that ants’ favorite foods are sugar, honey, jelly, and syrup. These seem easy enough for Pym Technologies’ HR department (or, I guess, IR) to keep on hand, but I shudder to imagine what the office kitchen looks like. How are the humans communicating with the ants? According to the Marvel wiki, Ant-Man’s suit allows him to communicate with his formicarian buddies through “psionic/pheromonal/electrical waves.” But, in the course of both films, we never see an ant refuse to follow an order from, or even disagree with, its human bosses. Is this proof of the ants’ strange collective consciousness, or do they simply fear workplace retaliation? How much free will do they actually have? Similarly, in one scene in the film, multiple ants lay down their lives in order to spirit Ant-Man on to the next stage of his adventure. Are these noble insects intentionally sacrificing themselves for the greater good, or are they supposed to blindly follow Ant-Man’s orders with no regard for their personal safety? If so, you’ve got to figure a hostile-workplace lawsuit is in the cards real soon. Anyway, just something to think about when you’re in the multiplex this weekend. Ant-Man director Peyton Reed, please get back to us with answers to these questions at the earliest opportunity.